If winter comes, can spring be far behind? With floating petals, Angel Nemesia arrives to awaken spring in Sapphire. Players have been curious about her origin and her magic power. Great news is that Nemesia will show up in the Cross-server Resource Tycoon and wait for the bravest the warriors to take them into their squad! Let's know more about her abilities. Nemesia's unique skill "Thousand Bloom" can increase the DEF and Dodge of the entire squad by 20% for 3 turns; also greatly increase the DEF of the 2 allies with the lowest HP when they are hit by control effects. As currently players can deploy five angles at most, this new angel will greatly boost the squad strength! 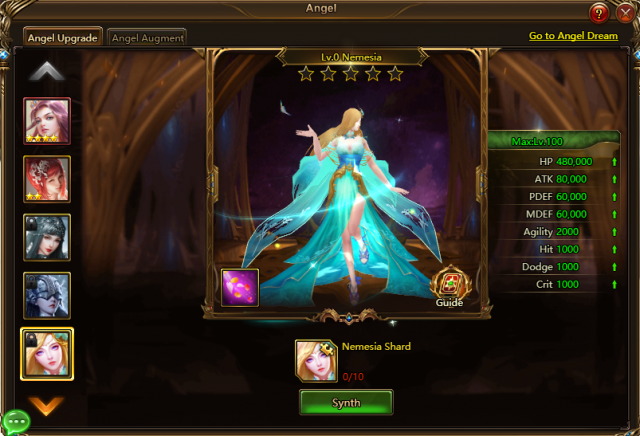 Please note that a spcial item Angelic Scroll are required to unlock new Angel slot. From Jan. 17th to Jan. 22th, Angel Nemesia will be available in Cross-Server Resource Tycoon. Collect various resources and rank higher in the tycoon rankings, you'll have the chance to get this new Angel and many other resources. Hurry up to take Nemesia to your squad! Play League of Angels II now and enjoy the simple joy! Next：New Clothing Brings You Good Luck in the New Year!